At SDC, we’re sometimes asked by parents if we can “challenge” or “push” a child more in class. The answer is not as simple as you might think, which is why we’ve brought the answer here to our blog! So how do our teachers make a difference when it comes to challenging your children to do more? If the push comes from within the dancer, then what are the teachers doing to develop each student’s progress? How do they respond to the push? Rather than prodding a dancer along, our teachers nurture the spark that has already come from within. It’s a spark that every child already has—and they’re in charge of igniting it themselves. Each teacher on our team is trained in pulling the best out of each dancer. When the students are pushing themselves to work hard, this allows the teachers to hone in on the abilities that shine through. They also strive to strengthen each child’s growth areas, inspiring new directions for that inner push to go. 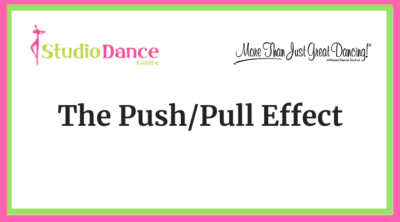 This is the push/pull effect in action! And its cycle continues over and over again throughout a dancer’s journey at SDC. We strongly believe that this philosophy gives our students the healthiest possible dance education. We’ve seen the proof that it sets them up for success!